A man, who at one time held GIANT status in my life, FELL. He fell hard. A community fell with him. His support team fell. Sadly, his family fell too. Because he’s a believer, he fell right into the arms of Jesus. It didn’t seem that way at first, but after repentance (true repentance) he found himself surrounded by the loving arms of God. It may not feel like it now, but he’s right where he needs to be. Healing. It’s a hard place. It feels low, dark, and a pain like no other. But he’s there. Truth is – we all fall. We are all fallen. 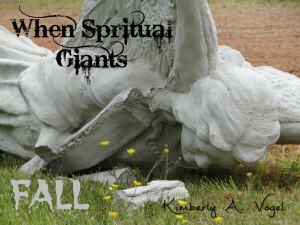 Finding out a spiritual giant has fallen really should come as no surprise. Truth is – when people put themselves in the spotlight, they are scrutinized. Over the past few weeks, all around the internet, is the video of Victoria Osteen making a statement now considered controversial. I’m sure she NEVER intended for people to react this way. Yet they did. And I agree. When a public person speaks, people listen. I applaud people for questioning Victoria Osteen. Bring everything you hear and line it up to the WORD of God. Maybe… just maybe… if we question our spiritual giants, they will think twice. Maybe… just maybe… we will see that they aren’t that giant after all. If I’ve learned one thing – it’s not to put someone on a pedestal. The only place they can go is down. Truth is – the only person we need to elevate is the King of Kings. So, my at-one-time spiritual giant, thank you for reminding me of your humanness. Take this time to heal. I’m praying for you, and your family.